← The Fix Is In! Zentangle is only twelve years old, according to a 2013 story in a local Worcester, MA, article. [http://m.golocalworcester.com/lifestyle/maria-thomas-and-rick-roberts-zentangles-a-worldwide-phenomenon/]. The article talks about “just nine short years ago.” Using some quick subtraction from the publication date of the item, I came up with 2004. Molly Hollibaugh’s forward depicts some of the excitement felt by the founders when they told her of the plan they had developed to introduce a new art form. My first thought on this brief description was, What a great example of researching a market and putting sound development practices into action! 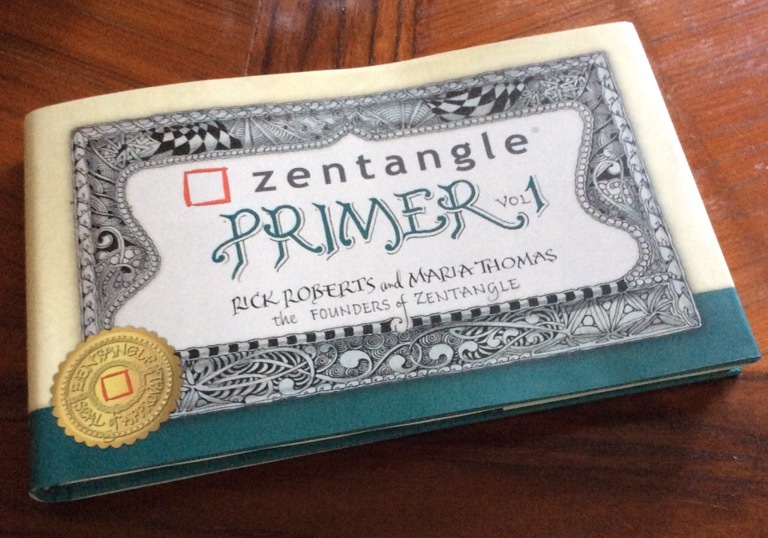 Thomas, a professional calligrapher, and Roberts, a psychologist (I believe this is what I read somewhere, but don’t recall the reference), pooled their talents and came up with the idea of Zentangle. They used artistic elements from Maria’s calligraphy and the meditative area of Rick’s psychology. The idea of art as therapy is not new. Calligraphy has been around for much longer. That Americans are always looking for new ways to relieve stress and that they enjoy the concept of creativity is intuitive at the least. That no one had put the two together before is most likely because few people think about the obvious when it comes to creativity. Successful businesses are often created because someone has thought about the obvious and, more importantly, has been willing to take a chance on selling this “new idea” to the public. Roberts and Thomas hit on a great idea, apparently only twelve years ago. Before implementing their idea, they developed a whole package–philosophy, tools, ritual (ceremony, the founders call it)– and probably researched the market for potential clients. They did their homework before initial implementation. That is a key to successful marketing. Zentangle is a very successful idea. The philosophy of Zentangle, beyond the meditative and creative elements, revolves around one simple, and copyrighted, sentence: Anything is possible one stroke at a time, and one idea that psychologists and art instructors have been preaching to clients and students for eons: There are no mistakes. That mistakes are opportunities is important to relieve anxiety and stress. In the arts, once an individual stops concentrating on perfection and instead concentrates on expression, creativity emerges as the “mistakes” become incorporated into the work and influence the work in progress. That the “error” can be called upon when the end result of the error is desired becomes part of an artist’s repertoire. It becomes part of the artist’s ongoing learning process. That’s the general idea, anyway. In psychology, a key to stress relief is to forgive oneself for erring, to use the lessons learned from the mistake so that the error is not repeated, and to determine steps that can be taken to avoid the similar mishaps in the future. The last is a creative process in itself, as each “avoidance” tactic is not only unique to the individual but to to whatever new similar situation one encounters. Brainstorming, itself a creative process, yields tools to adapt behavior. When the individual has too few tools, techniques can be taught by the therapist or group leader; thus, new tools are added to the individual’s arsenal. All of these emerge when one allows error to be part of life. Of course, the intent in both art and therapy is that brainstormed processes will be applied before the next iteration of the error has a chance to be made. The references are not clear, but I get the feeling that Zentangle started out as classes, workshops, or group therapy/meditation sessions. Soon Zentangle spread to the field of psychology and into the world of art. That both psychologists and artists embraced this art form quickly attests to both the intuitiveness of the idea and a need for such a process in both communities. Zentangle is becoming such a popular world-wide phenomenon that many “how to” books have been published. Where authors have wanted to diverge from the official Zentangle program, they have published books on Zendoodle, or meditative doodling, or other such variations. Longer established artist authors include sections on the meditative qualities of their art form when they release an updated edition or a new book. Many how-to drawing books now include a whole chapter on Zentangle Inspired Art (ZIA). Article upon article by psychologists speaks to the calming effect of Zentangle on clients. Bloggers share their own artistic creations or teach the basic tangle patterns using illustrated “step-outs” or how-to video clips. That no two artists’ depictions are 100% alike speaks to the founders’ idea of interpreting each pattern and its usage. Thus, Zentangle is a very flexible art form. That many interpretations of the basic patterns are taught as the original pattern is somewhat disconcerting. After all, how can one interpret a pattern that is already an interpretation? Yes, Zentangle is an emerging artistic and meditative process. Yes, the freedom to make mistakes lowers anxiety. Yes, the process of concentrating on each individual pen stroke is meditative in itself (concentrating on the repetition of a pattern within a given space) and puts one “in the zone.” Yes, the constraint of a small canvas (optimally a square artist tile measuring 3.5″ x 3.5″) limits both the outcome and the time needed to create a finished piece, making the art form both portable and do-able during a lunch break. Yes, the drawing of “strings” on this small workspace limits the work still more while also making the canvas no longer blank. Yes, I thoroughly enjoy creating Zentangles and ZIAs. Yes, I enjoy the creative element of interpreting a pattern and morphing it into a piece I am creating. But the lack of being able to find a standard–a base pattern on which to base my own interpretation, rather than my interpretation of someone else’s interpretation– for too many “original Zentangle patterns” creates a disconnect from the philosophy of Zentangle. To me, anyway. Every ceremony is based on standards someone has set somewhere along the line to keep the ritual clean and simple. Remove the “standard” from Zentangle and the copyrights break down to nothing more than a ceremony with legally protected words. Once the words become part of general usage, even a trademark name loses its legal status. Take, for example, the use of the word Kleenex to refer to any paper product with specific characteristics or purpose. Then there’s Frigidair that often refers to any refrigerating appliance found in most kitchens world-wide. Even Apple can’t keep people from referring to a music-and-video storage and playback system by another company as an iPod, even if the device is incapable of utilizing Apple software (although that is mainly true of older non-Apple iPods). At what point will the public start calling any scribble pattern a Zentangle? At what point will non-certified Zentangle teachers begin offering Zentangle classes, regardless of their deviation from or adherence to the philosophy and/or ceremony and/or patterns of Zentangle? The official site for Zentangle offers (or used to offer) step-outs for a good number of patterns that exemplify the standard for the motif. The selection was limited to start with. Now, even the relatively new Zentangle Mosaic app (available for portable Apple and Android products) has only a small portion of official step-outs. In fact, the Mosaic app has references to patterns that appear on tiles by a single person. When multiple unknown pattern names appear on a given tile and none of them come close to a named pattern on either the site or on YouTube, how does one figure out which “new pattern” is which, and whether it or they are little more than the artist’s personal doodles? In reality, Zentangles are doodles. The standards for some patterns often represent motifs that you and I have been drawing for years–I for more years than most of you reading this post. Because they are doodles, there can be no formal standards. It is the method that is important. It is the method that makes Zentangle unique among all meditative, therapeutic, and artistic forms. Personally, I really love the whole idea of Zentangle. When I have the urge to create but can’t find something I want to render at the moment, I turn to Zentangling. It allows me to create something out of nothing. The Zentangle Mosaic app has so many miniature artworks posted to it that I can always find a source of inspiration even on my most “blocked” days. When I am particularly anxious about something, the repetition of strokes and concentration on getting the strokes right is calming. If you haven’t tried it, visit the Zentangle site or search on a book on Zentangling to get you started. This entry was posted in Art, business, Writing process and tagged business model, Zentangle, Zentangle history, Zentangle method. Bookmark the permalink. By definition (see Webster and Wikipedia) a doodle is a mindless drawing. Once you start paying attention to it (the essence of Zentangling), it stops being a doodle. You are welcome to call the patterns whatever you like. However, I would like to point out the definition of doodle on Wikipedia states, “A doodle is a drawing made while a person’s attention is otherwise occupied. Doodles are simple drawings that can have concrete representational meaning or may just be composed of random and abstract lines, …” Attention being elsewhere is not the same as “mindless.” However, “attention being elsewhere” might be intellectually construed as an important element of meditation. While one keeps part of the mind on a repetitive process or activity, the rest of the mind is free to explore all sorts of ideas and problems. I haven’t checked the definition in Webster’s dictionary yet, as I generally use American Heritage or Oxford, mostly because they are better at providing clearer definitions and examples, and tend to give all definitions of a word, even those specific to a particular group or region. However, I doubt that the word “mindless” would show up in Webster’s definitions, either. Terminology really makes no difference. I was referring to the patterns themselves as doodles, not the Zentangle Method. Big difference. You will note that none of the Zentangle patterns is copyrighted. Naming them is not the same as “inventing” them. However, naming patterns provides a common terminology associated with certain patterns in the Zentangle Method. If I say “the Static pattern,” all Zentanglers immediately see organized repetitions of a zigzag motif. As a person who has studied patterns all her life, beyond the original first 40 or 50 patterns, I have yet to come across a pattern that isn’t a mere tangleation of one or two of these originals. Even the originals are basically derived from the same sources responsible for all doodles–imitation and/or interpretation of simple patterns observed in or extrapolated from one’s environment or resources. And there is nothing that says that doodles can’t be repetitive patterns, or that the patterns can remain nameless or be named. Zentangle has also popularly become an art form. Tangleations and “new pattern” development is encouraged by the founders in part because of the creative interpretations each tangler brings to his or her art. And every individual who continues to use original, interpreted, or invented Zentangle patterns is an artist. Calligraphy, which purportedly gave rise to the idea of Zentangling is itself an artistic form of writing–perhaps not originally, but certainly through modern usage. A calligrapher is an artist. To briefly return to the Wikipedia’s definition of doodle, they “can have concrete representational meaning.” Art is representational, especially of the artist’s interpretation of the world around him or her, or of meanings he or she represents in forms that are experienced by others. So even doodling can be art. Bottom line: the terminology is far less important than the methodology in Zentangle. It is the ceremony–the celebration of the ritual aspects that lead to and from the meditative experience of Zentangle–that defines the Zentangle Method. It is why the method is copyrighted but the patterns are not. Therefore, for the purposes of the Zentangle common language, each Zentangle pattern is called just that. Outside of Zentangle, each motif can be, and often is, just a doodle. What an interesting topic! I have been zentangling for only a few months now and I am just amazed at how much information there is out there. So many patterns and strings and artwork! I love watching others on YouTube. I learn so much and continue to learn daily. I’ve only been at Zentangling since Late March, first following One Zentangle a Day while supplementing with what I could find on the official site and YouTube videos. When I saw the Zentangle Mosaic app, I downloaded it immediately. It relaxes me and gives me ideas and skills for traditional drawing. I live on a small Caribbean island and don’t have the option of finding certified teachers here, so I am self-taught and learning more. When I ran across the news article that hinted at when Zentangle started, it amazed me how quickly such a small “industry” was able to influence both art and psychology. No one part of Zentangle is a new idea, but the method was very creatively developed and presented. I am in awe. Best wishes with your tangling! I am also self taught. Although there is a CZT close, I don’t have the time to schedule classes. Usually I do all my art late at night or on the weekends when my kids are asleep. I love it though and it is transforming my art in BIG ways!